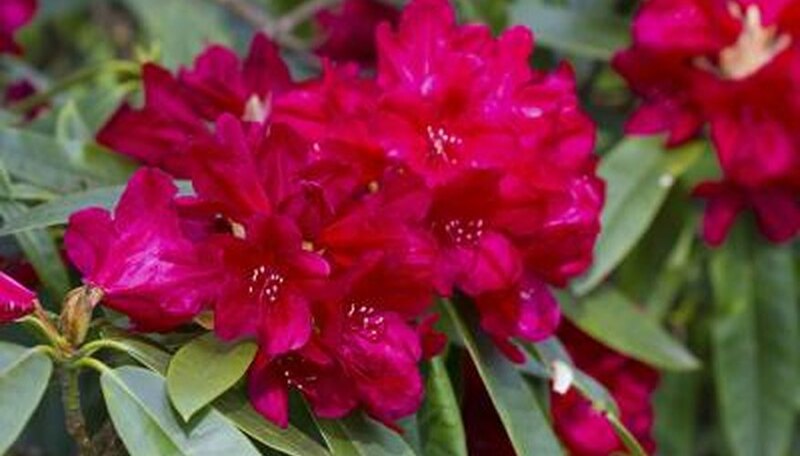 The rhododendron (Rhododendron spp.) is renowned for its circular clusters of bell-shaped flowers that come in many colors, including pink, red, white and lavender. It typically has large, deep green leaves that form rosettes surrounding flower clusters and stay on the plant year-round, although some types are deciduous. This is an attractive plant even when not in bloom, but it can be disappointing to nurture a plant through the year only to have few if any blooms appear at flowering time, a problem that can have several different causes. Rhododendrons generally grow in U.S. Department of Agriculture plant hardiness zones 4 through 8 or 9, depending on the specific variety. In these regions, temperatures can drop below freezing for a few days at a time during winter. Rhododendron flower buds form in late summer and usually come through these brief periods of frost unharmed, but an especially cold winter might damage or destroy buds, especially if it's accompanied by strong wind that can dry out the buds. Building a windbreak by surrounding the plant with burlap secured to stakes driven into the ground can help prevent this. An unexpected frost in early spring might also damage buds and prevent them from opening, especially if you're growing a variety that's an early bloomer. A rhododendron needs soil that stays consistently moist and allows the plant's fine roots constant access to water for good flower formation. In some portions of the rhododendron's range, summer weather might include dry spells or even a period of drought, conditions that can interfere with formation of flower buds or cause those already developing to dry up and drop off the plant. If you check the plant's soil and it's dry about 5 inches below the surface, give it supplemental water, aiming for about 1 inch per week, including any rainfall. The plant also benefits from application of a 2- to 3-inch-thick layer of organic mulch spread on the ground under its canopy -- this helps conserve soil moisture and also keeps down weeds that compete for water and soil nutrients. The rhododendron thrives when grown in light shade, ideally near tall trees that cast drifting shade or at the edge of a tree line -- this mimics their natural growing conditions. But too much shade can interfere with flower bud formation and result in few if any flowers. A spot that gets some morning sun, followed by shade in the afternoon, is ideal -- avoid exposure to direct afternoon sun, which can cause leaves to curl and buds to dry up. Pruning at the wrong time can also affect blooming by removing flower buds, so cut back a plant that needs shaping immediately after it blooms in spring or early summer, to allow new, bud-forming shoots enough time to form before winter. Avoid pruning in fall or winter, because the next year's flower buds have already formed. Rhododendrons can be susceptible to a disease called petal blight that might be especially damaging to buds or to flowers beginning to open. It's caused by a fungus that starts as irregularly shaped, brownish spots on buds and young petals, making them look freckled. Spots get bigger, become soft and the entire bud eventually rots. Petal blight is best controlled by quickly removing any affected buds or flowers to prevent its spread, but disinfect shears between cuts with rubbing alcohol to avoid spreading the fungus. Also avoid overhead watering that can spread fungal spores, and remove any dropped buds or other litter regularly from the area under the plant. It's also a good idea to remove old mulch, which can harbor fungus, and replace it with fresh mulch.